Przewodnik historyczny po Grabowie i okolicy. The construction of the current building of the church started in 1903 and finished in 1917 according to. 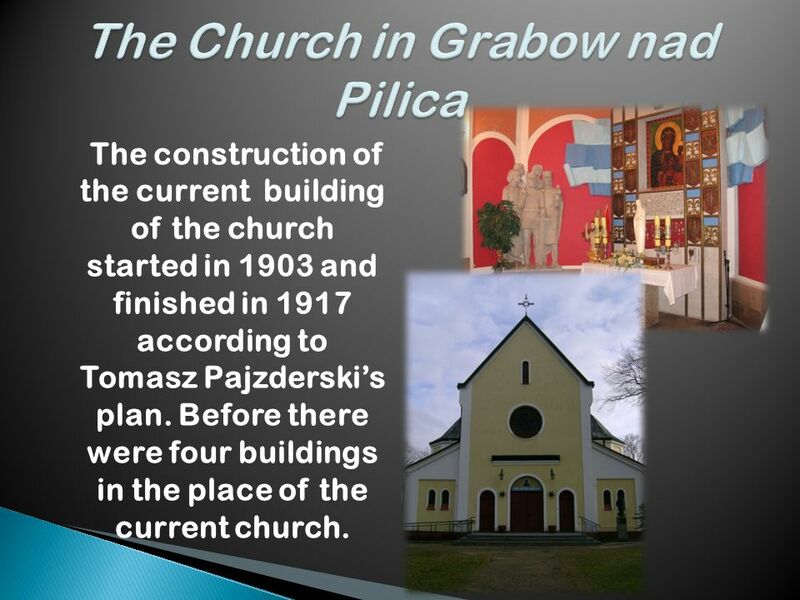 2 The construction of the current building of the church started in 1903 and finished in 1917 according to Tomasz Pajzderski’s plan. Before there were four buildings in the place of the current church. 3 In 1944 there was a parachute dump of Cichociemni in Paprotnia. 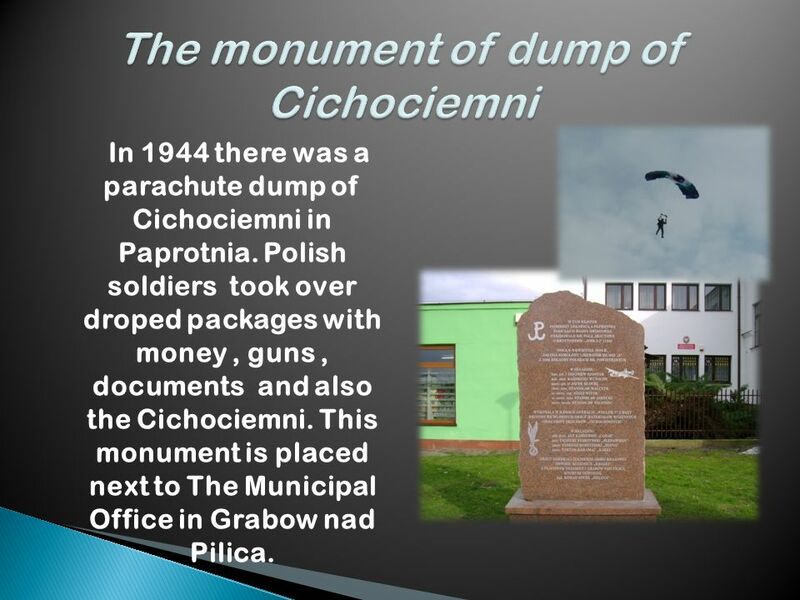 Polish soldiers took over droped packages with money, guns, documents and also the Cichociemni. This monument is placed next to The Municipal Office in Grabow nad Pilica. 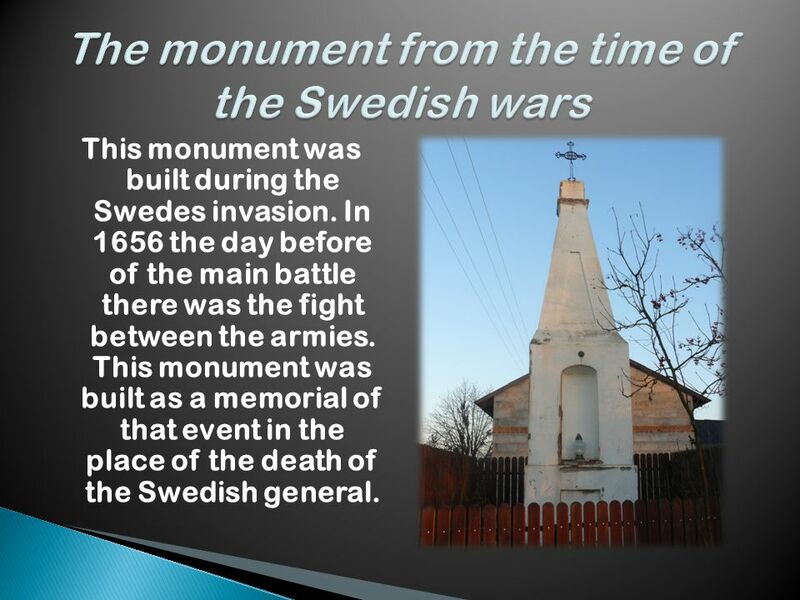 4 This monument was built during the Swedes invasion. In 1656 the day before of the main battle there was the fight between the armies. This monument was built as a memorial of that event in the place of the death of the Swedish general. 5 The current building of the Municipal Office was an office of the guards during the partition of Poland. It was rebuilt in the sixties. 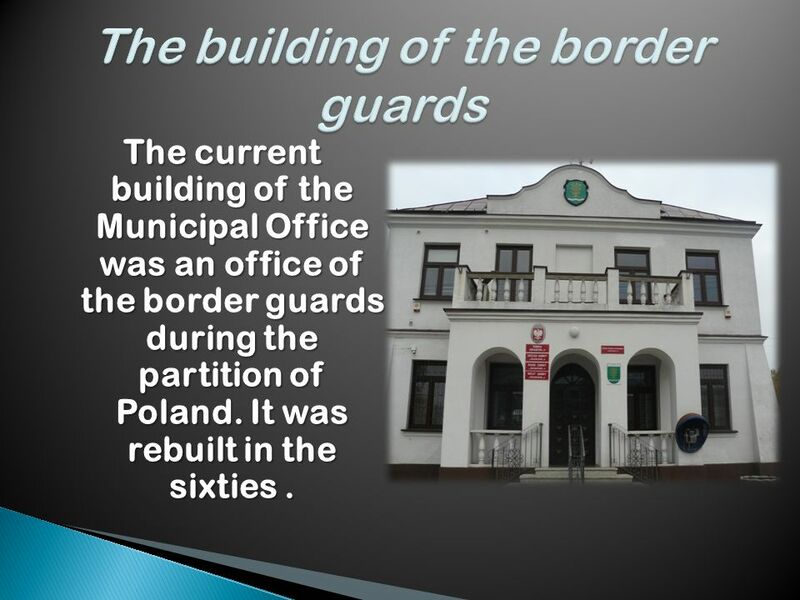 The current building of the Municipal Office was an office of the border guards during the partition of Poland. It was rebuilt in the sixties. 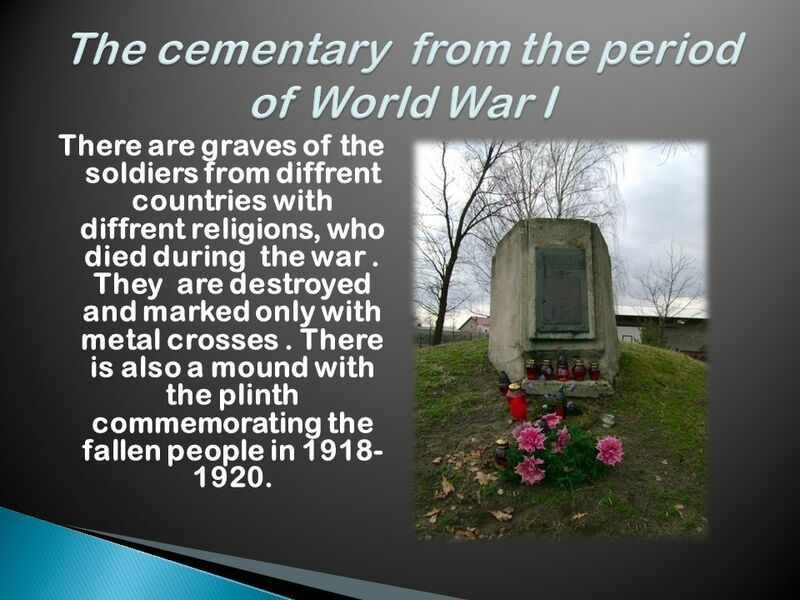 6 There are graves of the soldiers from diffrent countries with diffrent religions, who died during the war. They are destroyed and marked only with metal crosses. There is also a mound with the plinth commemorating the fallen people in 1918- 1920. 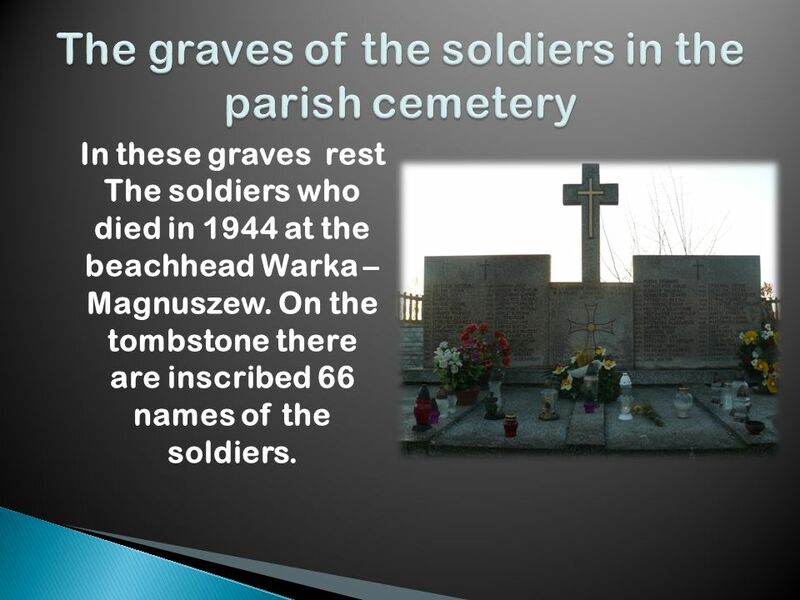 7 In these graves rest The soldiers who died in 1944 at the beachhead Warka – Magnuszew. On the tombstone there are inscribed 66 names of the soldiers. 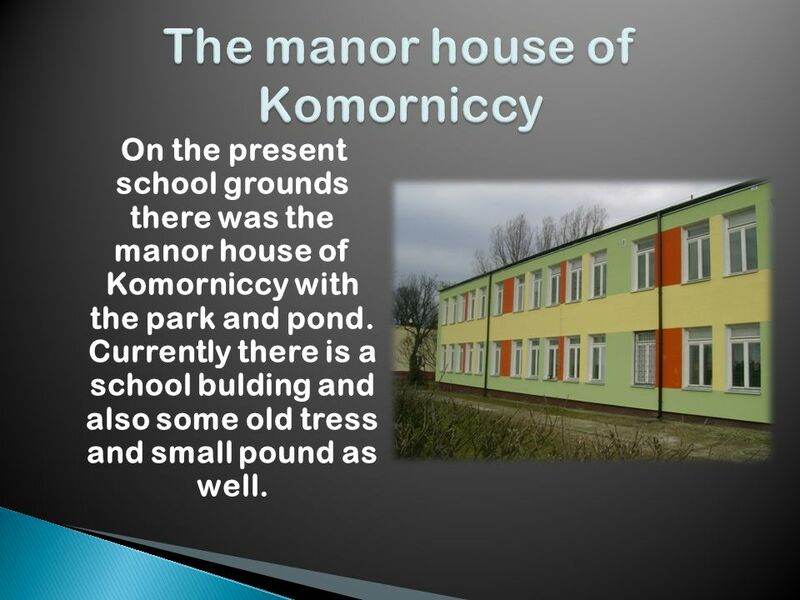 8 On the present school grounds there was the manor house of Komorniccy with the park and pond. Currently there is a school bulding and also some old tress and small pound as well. 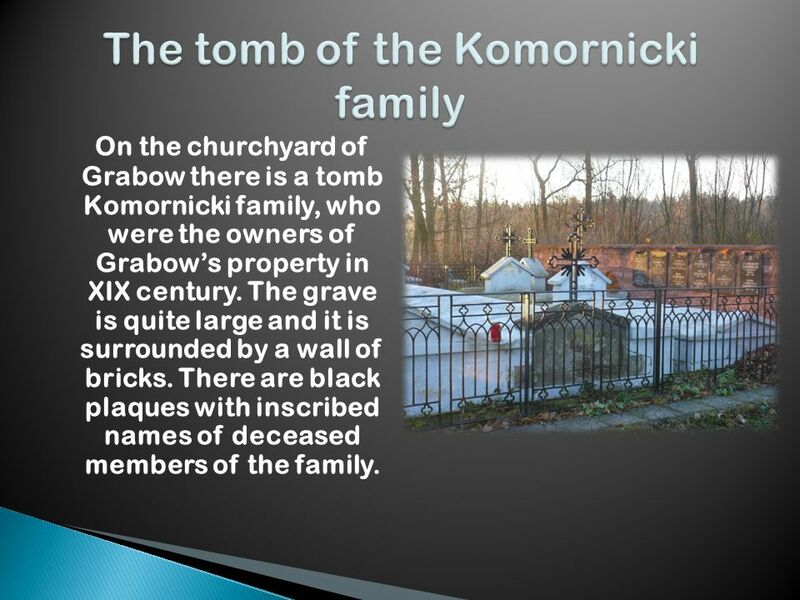 9 On the churchyard of Grabow there is a tomb Komornicki family, who were the owners of Grabow’s property in XIX century. The grave is quite large and it is surrounded by a wall of bricks. There are black plaques with inscribed names of deceased members of the family. Download ppt "Przewodnik historyczny po Grabowie i okolicy. The construction of the current building of the church started in 1903 and finished in 1917 according to." All Hollows Day First of November by Kamil K.. This is how our cemantaries look like on the 1st of November. Kaplan, Louisiana. Kaplan is called the "Gateway to the Coastal Wetlands". Like the other Vermilion Parish areas, hunting, fishing and farming are all. By Jihad Muhammad. My name is Chop Sue I was born August, in Tokyo Japan. As kid my parents always taught to be great at every thing I do. My dad. By Rafic Fakhri. A.N.Z.A.C. was the name given to the Australian and New Zealand Army Corps soldiers who, landed on the Gallipoli Peninsula in Turkey. Washington D.C. Trip April 6–9, Mom, Dad and Nick outside of the Basilica of the National Shrine of the Immaculate Conception Washington, D.C. Foundation. Nový Jičín Town Tereza Ivanová & Michaela Horáková. What Else ? Other major events of the Middle Ages. Castle Gardens The Lisburn Coat of Arms Do you know what all the elements of the Coat of Arms represent? What is Lisburn’s. Gda n ska (Shoemaker’s) Tower It was built around 1325 and is the best preserved object of Gothic defensive architecture. It is situated on the Wierzyca. The flag of Żory Coat of arms The Seal In the period of creating Polish statehood the land of Żory, as it is now, was inhabited by Golęszyców tribe. The Emperor’s Clay Army How did Shi Huangdi build an empire in China? Mount Vernon Plantation When George Washington lived here, Mount Vernon was an 8,000-acre plantation divided into five farms. Each farm was a complete. Essential Question: How have attitudes toward the burial of the dead changed over time? My country Monuments. Rozniszew Mound was created in 1917 to commemorate the heroic Kościuszko. It is located near the Rozniszew. Mound was created in. Terracotta Army animoto video  T he Terracotta Warriors are the most significant archaeology find of the 20th century. The Warriors were made to fight. Great Buildings and Architecture By the 5 th Grade Class. Baťa´s houses  In 1931 Tomáš Baťa bought a factory in Třebíč- Borovina and then a construction of first (family) houses according to plans of Vladimír.